Abundance Wine Country: Figs have arrived in the markets! Summer figs are in the markets now. 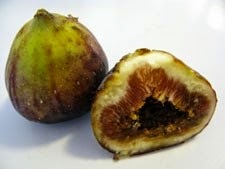 I confess that I am a fig lover, but I have noticed that not everyone knows what to do with figs. Of course, you can eat figs fresh off the vine like any other summer fruit--just pop them in your mouth and chew. a diet rich in meat and refined foods. I think they're best, however, dressed up just a teensy bit with some other favorite flavors. Keep it simple, though. Figs have such a distinctive and strong flavor that there's no need to over-complicate things. 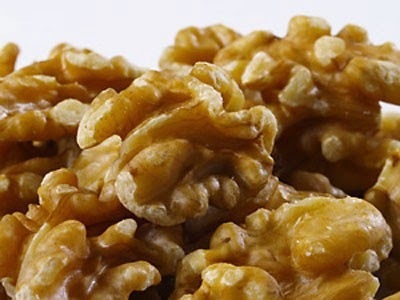 One of my favorite quick and easy things to do with figs is to cut them into bite size chunks, load them into a small bowl and top them with chopped walnuts. Figs and walnuts together must be an ancient culinary combination, wouldn't you think? Anyway, there's no need to monkey with thousands of years of happy eating. Try this and you'll agree that the two flavors are very complimentary. Sometimes, if I feel like treating myself, I'll top the figs and walnuts with a little dollop of ice cream or yogurt or even a handful of granola. 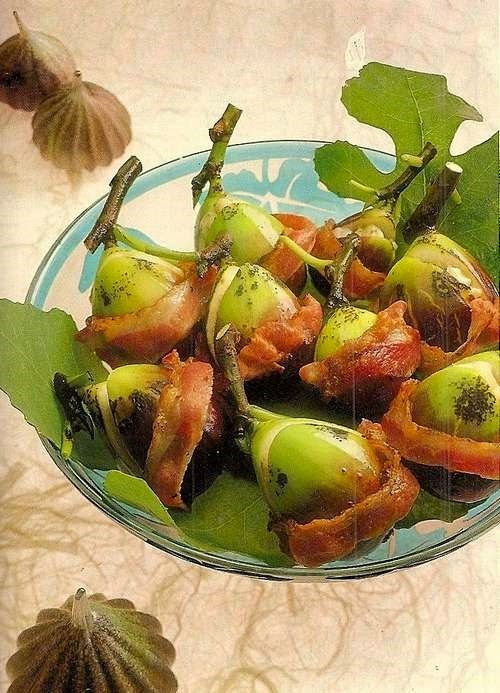 Equally simple but absolutely knock-your-guests'-socks-off, is this fabulous fig appetizer recipe from one of Debbie and my favorite chefs, Hugh Carpenter. I used to take cooking classes from Hugh when I was living in LA. Now he lives and teaches right in the heart of the wine country. This recipe for Grilled Figs Stuffed With Blue Cheese came out of his "Fusion Food Cook Book". I think it's a lot of fun to have the grill going when guests arrive. You can even enlist their help in stuffing the figs and rolling them in the pancetta. Then everyone can stand around the grill with a cocktail and mouths watering waiting for this to be gently heated through. Think soft melty cheese inside and the pancetta perfectly crisped on the outside. This is making my mouth water as I write! Cut the figs in half only halfway. Toast the walnuts in the oven and cool, then chop. Place the walnuts, blue cheese and cognac together in a small bowl and using the back of a fork, blend together until evenly mixed. Stuff the figs with the cheese mixture., then wrap the pancetta around the figs and secure with a toothpick. If using a gas barbecue or indoor grill, preheat to medium (350 degrees). If using charcoal or wood, prepare a fire. When the coals or wood are ash-covered or the gas barbecue or indoor grill is preheated, brush the grill with oil. Brush the figs with balsamic vinegar, then place the figs on the grill. Cover and cook about 2 minutes, rotate half a turn and cook another 2 minutes. Serve at once. By the way, the blue cheese cognac and walnuts are divine together, but I've made this with goat cheese and I've also used bacon. It's all good! Just get figgy with it.